Arthritis affects over 15% of Indian population which is around 180 million people. Coping with the pain and inflammation of arthritis can become extensively laborious over the time if the patient is not ready to make healthy lifestyle changes. 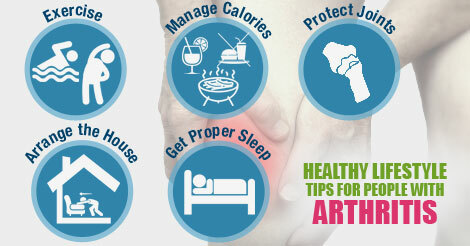 Here are few tips which can ease the life of arthritis patient on day-to- day basis. While it is difficult to sleep with pain, but one has to accept the problem as a part of life and must attempt to sleep well. Studies suggest that sleep techniques like listening music, reading, or taking sleep medication occasionally can help to get proper sleep and thus prevent exacerbation of symptoms. Try to get in the bed on same time daily and avoid surfing or watching television. It is a myth that a patient with arthritis must not exercise. Contrary to that, exercise slow down the loss of muscle mass, improves joint mobility, reduce pain, and helps to sleep better. One must ensure to perform a mix of aerobic, strengthening, and stretching exercise on daily basis. Swimming and aquatic aerobics are very good for arthritis patients. It is important to maintain healthy weight to reduce stress of weight- bearing joints of the body. Manage your food habits and therefore calorie intake. Avoid foods which are known to be unhealthy and increase weight like fried foods, fast-foods, food high in sugar and fats, and red meat. Try to learn the techniques for protecting your joints from your physiotherapist. A patient with arthritis must ensure that any stress or weight is distributed on larger joints or whole body and smaller joints are protected. For example, do not push a door to open it, rather lean on the door and push it with your body. Arrange your house and make it more convenient and safe for you. Small tips like moving furniture to side walls to create larger space and removing obstacles like plantations can reduce the chances of falls and prevent related injuries.